Pressed from the nut of the African shea tree. This silky and luxurious butter is used predominantly for skin care where it is hailed for its protective and emollient (moisturizing) properties. It is perhaps the most moisturizing butter in our selection with high amounts of vitamin E, A and other natural nutrients. The high amount of vitamin E helps to soften skin. Shea butter provides minimal sun protection (SPF of about 3 to 5). 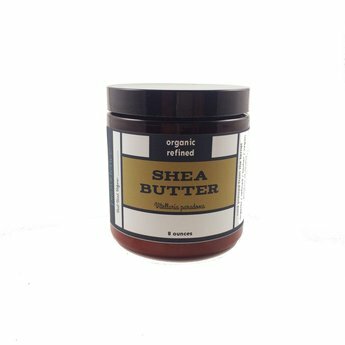 Shea butter is also one of the very best butters for soothing irritated skin. Note that some allergies do exist and shea butter can leave a slightly greasy feeling on the skin. It is most appropriate for dry skin types or blended with a ‘drier’ oil for normal skin types. Cleopatra of Egypt was said to have travelled with clay jars containing shea butter for her personal cosmetic use. Store in a cool dark place. If shea butter is not cooled in a cool place, it may result in a grainy texture. If this does occur, simply heat the shea butter gently in a warm water bath until melted, blend, cool quickly (in a refrigerator perhaps), and store in a cool area. It should keep about 1 year when stored properly. The cinnimic acid esters of shea butter may be irritating for some people. Shea allergies do exist.